Hi everyone! I’m Carie Fisher and today I will be talking about Easy Ways to Make Your Site More Accessible. Carie Fisher Senior Front End Developer - Mediacurrent Website developer, graphics guru, Drupal diva, broke technophile, and Star Wars fan (by default). What is website accessibility anyway? Wikipedia says that “Web accessibility refers to the inclusive practice of removing barriers that prevent interaction with, or access to websites, by people with disabilities. When sites are correctly designed, developed and edited, all users have equal access to information and functionality.” So basically, make your site available to as many people as possible. Who is website accessibility for? Why should I care about website accessibility? I should say these are my unofficial guidelines or rules, your guidelines or someone else’s guidelines might be a bit different and that’s ok. The point is that we are thinking about accessibility in some way when designing and developing our sites. Rule #2: Learn a Few Things - read an article, watch a video, attend a webinar, chat with someone on twitter. If you focus on one aspect of accessibility at a time, you will not get overwhelmed and you will retain the information better. Rule #3: Build from the Ground Up - if you have the opportunity, work the accessibility into the beginning of a project. It will be more difficult, more timely and thus more expensive to retrofit your site for accessibility after the site is complete. Do or do not. There is no try. I love Yoda and generally find myself agreeing with his logic, but not in this case. Rule #5: Try, Try Again - even adding one or two accessible pieces to a website is moving in the right direction. The next site might have four or five pieces. “Rome wasn’t built in a day” and neither are accessible websites. 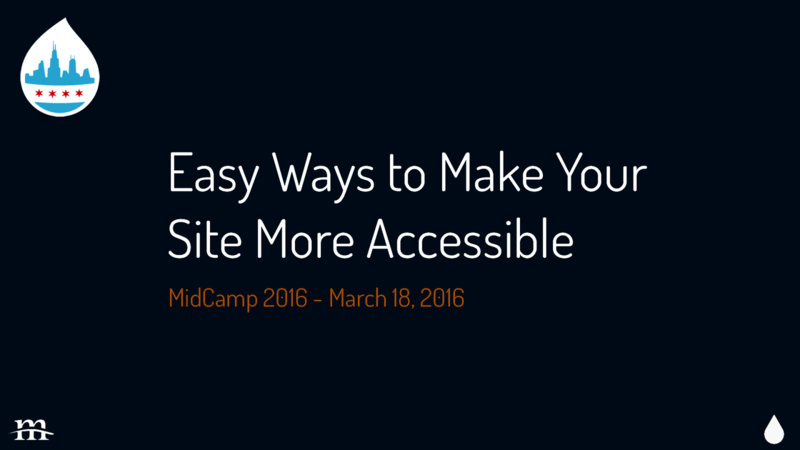 Now we come to the “easy” things you can do to incorporate accessibility into your website. I say easy in quotes, because collectively all of these tasks seem a bit difficult or at least overwhelming, but really each task on its own is easy to accomplish. Before we even began the challenge, our fearless accessibility leader Mickey Williamson gave us lots of resources and guidelines. Here are some of the things she had us think about while we were building the site. Now time for your own challenge…the next time you build or design your next site, I challenge you to take one or two accessibility tasks from each section and try to incorporate it. Like any new skill, incorporating these tasks might seem awkward or take a little more time than you are used to, but you will soon see that these tasks will become second nature to your build or design process. The following three slides will give you a head-start on some of the accessibility resources out there. I have listed some links to good general information as well as guidelines, checklists, and tools that might be useful. View Easy Ways to Make Your Site More Accessible on Notist. Website accessibility is often an afterthought at the end a project when there is an accessibility audit or a user submits an issue, but what if we switched focus and started thinking about accessibility at the beginning of a project during the initial design and development stages? In this talk I will present a quick overview of website accessibility (the what, who, and why), then review the underlying guidelines to making a site accessible, and finally present some general rules to keep in the back of your mind while designing and developing your next site. Not only will incorporating accessibility into your daily lives help people with disabilities actually be able to use your site, but it can help attract a wider audience/larger customer base, make your site rank higher with search engines, and can improve your overall user experience on both desktop and mobile devices. Carie puts presentations on for free. You can too.